I use my slow cooker (also commonly referred to as a crock pot) a lot during the colder months for hearty recipes such as rich braises and stews. But I think it’s an indispensable tool no matter what the season—even summer. Yup, that’s right, I said summer. I use my slow cooker in the summer so I don’t have to turn on the stove or oven, which keeps my kitchen cool and comfortable. And there’s the added luxury of finding dinner ready when I walk through the door, so I have more time to enjoy the beautiful weather. One of my favorite slow cooker chicken recipes are Greek Chicken & Vegetable Ragout, which is simple to prepare and the lemony hit you get with this recipe is light and refreshing—indicative of summer. I also love to make Barbecue Pulled Chicken. 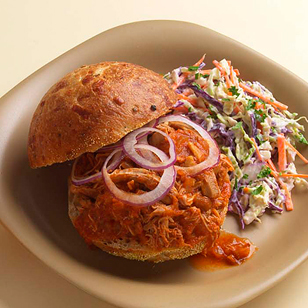 Pulled chicken in the slow cooker, a fanciful reinterpretation of pulled pork, is easy and makes for a finger-licking-good summer sandwich. Have sliced jalapenos, sliced red onions and some sour cream on hand to top this hearty main course. When it comes to vegetarian slow cooker recipes, Barley Risotto with Fennel is a nice option for a vegetarian meal and it takes advantage of another summer veggie—fennel. And of course, there’s Slow-Cooker Yankee Bean Pot. Who doesn’t want to chow down on some good old-fashioned baked beans at a summer picnic or potluck? If you bring this dish to an inside gathering, transport it in the slow cooker, plug it in and keep it on a low or warm setting to keep it warm. And I use the eggplant and zucchini we grow in our garden in Slow-Cooker Turkish Lamb & Vegetable Stew. After cooking slowly for hours my homegrown veggies become melt-in-your mouth tender. Yum. Thinking about buying a slow cooker? Find out which brand the EatingWell Test Kitchen cooks recommend here.